Hardcover textbook and matching e-Book! Why have to choose between technology OR a great textbook? With Essential Physics you can have the best of both worlds, a great full-color, hardcover textbook AND an extraordinary, interactive e-Book for less than you would traditionally pay for either. All the power of the e-Book is accessible through PC, Mac, tablet, and even smart phones! All academic standards are also met with the printed text that is page-for-page identical to the e-Book. You have the peace of mind of a reliable, clean, textbook while allowing students to enjoy all the interactive benefits of the e-Book. Parents are happy to see a book and Essential Physics offers an ideal transition strategy between today's classroom and tomorrow’s technology-enabled classroom. No individual student accounts: With Essential Physics each school gets a single annual access code that is shared by all students. There are no individual student accounts. For example, a school purchasing 100 e-Books may freely allow any 100 students to use the curriculum, exchanging students as necessary, including 100 different students each year—without any additional costs or account hassles! The only administrative requirement is to report enrollment on a simple on-line form once per year to obtain the next year’s access code. One enrollment number, once a year. That’s easy to administer! No installed software: The Essential Physics e-Book is an encapsulated HTML5 file that can be opened locally from any browser. 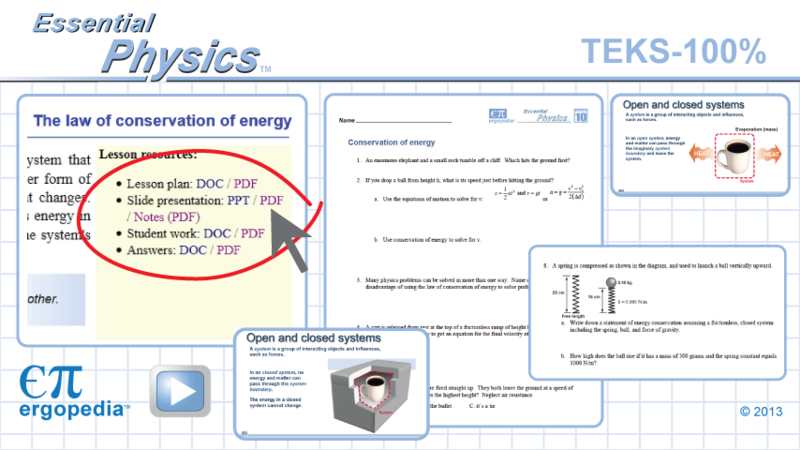 Simply copy the Essential Physics folder onto any device or intranet server. That’s it! There is no software to install to use the e-Book. Runs on virtually all browsers: The encapsulated HTML5 e-Book technology means Essential Physics runs on Internet Explorer, Safari, Chrome, Opera, and Firefox. 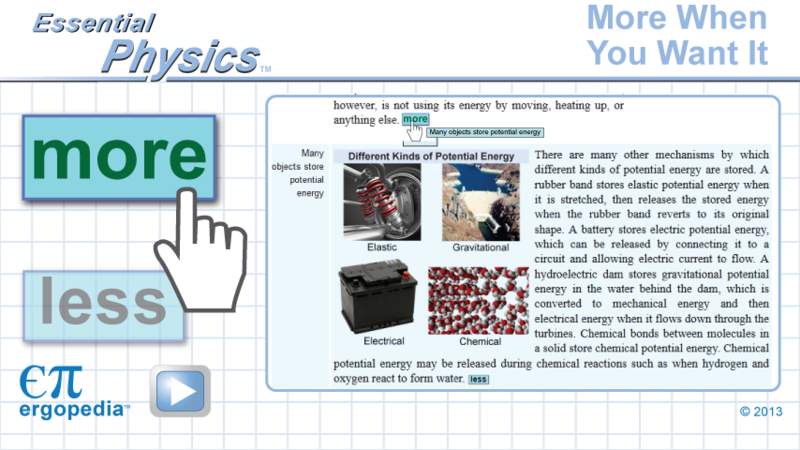 Runs on virtually all platforms: By having such broad browser capability, Essential Physics runs on Macs, Windows machines, Android tablets, iPads, and even smartphones. While no technology is truly future-proof, Essential Physics is 100% compatible with well-tested, internationally supported HTML5 making this e-Book technology as reliable, and cross-platform supported as possible. to the Internet, but not student access. Suppose you get interested and want to know a little more about something. 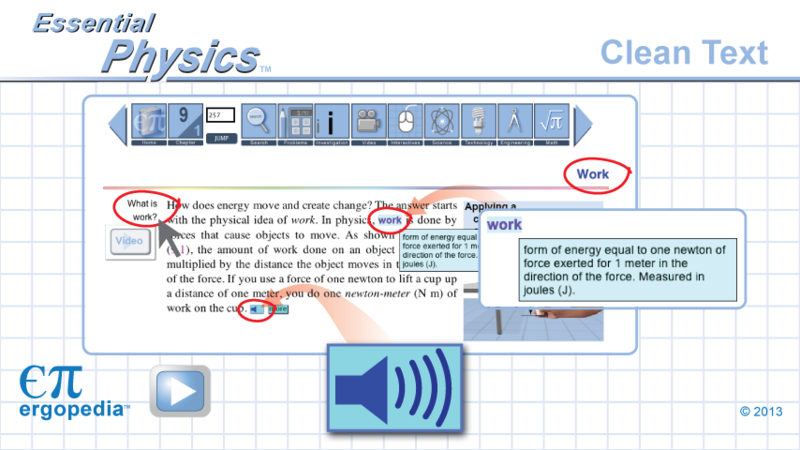 Paragraphs in Essential Physics that have more buttons expand to give a curious learner deeper or expanded content, just where they want it and ONLY when they want it. The 880 pages of core content expand to more than 1,200 pages when you include the MORE paragraphs. This richness allows each student to engage with something that catches their fancy. When is a high score not about winning? The answer is when it is about learning. Video game designers have mastered the art of engagement by providing instant performance feedback. This is a great learning enhancement! 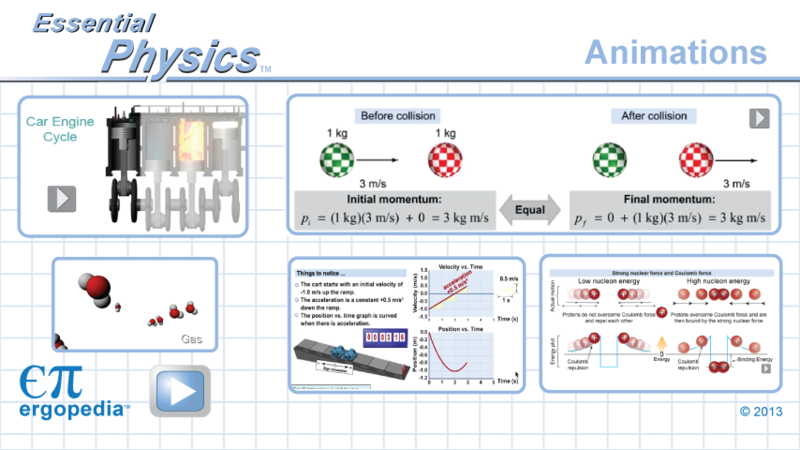 Our interactive simulationschallenge students to learn and apply physics concepts to realistic situations with real-time feedback on how well they are doing as they work. Can they get 100? It is a lot more interesting to DO it than to listen or read about it! student assignments and answer keys. Essential Physics comes with 136 complete lessons that meet 100% of the Texas physics content standards (TEKS) and science-related English language proficiency standards (ELPS). The lessons contain more than 6000 illustrated slides, student assignments, answer keys, and detailed lesson plans. These resources are instantly accessible with one click from the Teacher's Edition. Clicking these links gets you both the printable PDF and the editable documents in PowerPoint or Word formats. How fast does Earth move in its orbit? What would happen if the planet moved slower? How do you get from Earth to Mars? Simulations allow students to explore and try experiments that are impossible to do in the classroom but have extraordinary learning potential. Furthermore, you can change things quickly and evaluate what happens. They can experiment to understand the molecular meaning of temperature. They can quickly create models of waves, sound, or light. This interactive experience unlocks powerful new modes of learning. 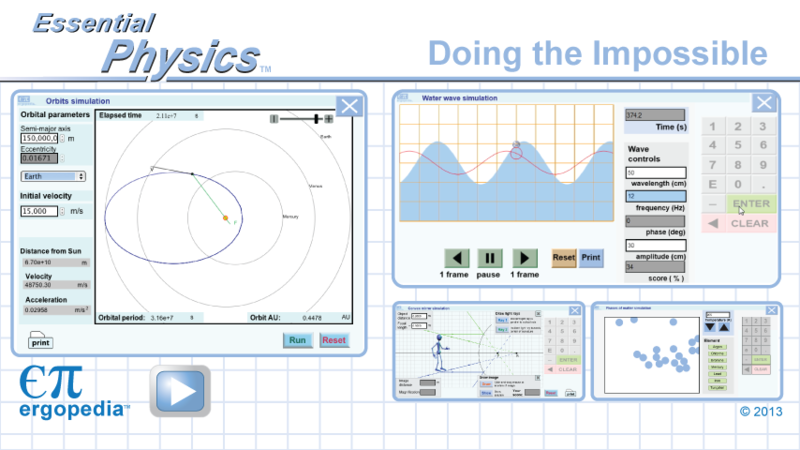 Essential Physics has more than 100 interactive tools that give you the power to control live simulations and interactive equations from a smartboard or projector. You can instantly explore how changes in one variable affect the others. Take negative acceleration as an example. A positive velocity and a negative acceleration look like this. How about a negative velocity and a negative acceleration? These teaching tools connect you directly with what the students do on their own e-Books in a powerful and effective way. What is a gas? What is a solid? How are solids and liquids different? Reading about it is not that informative. A picture is better but still doesn't explain well. One look at an animation tells the story in a way that immediately gets the big ideas across. Essential Physics is full of animations that are much deeper than just moving pictures. Each one is the result of many hours of careful research to be sure the physics is RIGHT and the learning objective is well met. Every equation has an interactive calculator that lets you and your students explore the MEANING of each relationship. Changing variables and IMMEDIATELY seeing what happens opens up new modes of learning that are impossible with a static textbook. The RELATIONSHIPS in an equation become learnable, and not hidden behind the symbolics. Well organized, outlined, and it even reads to you! Every page has one main idea. Every paragraph is outlined with the main idea in the margin. Every glossary word gives you the definition on a simple mouse-over. This button means each paragraph reads to you in a real human voice. A good video is worth a thousand pictures! What if a student misses a key lesson. How do they catch up? What if a student wants to know more about something—such as how an engine works? 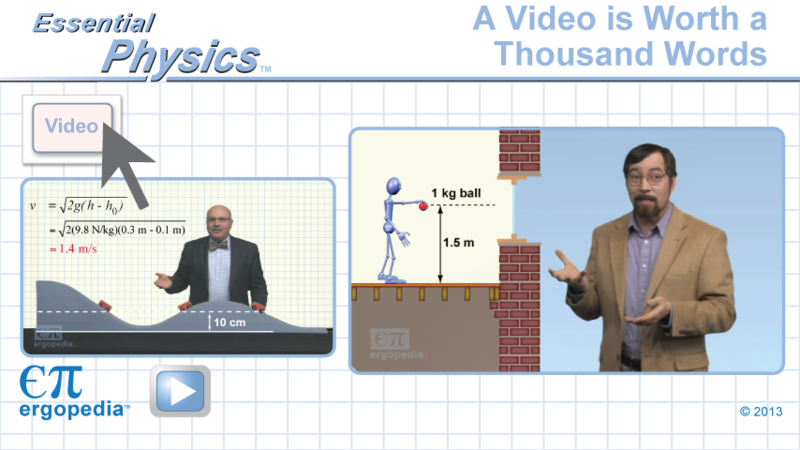 Essential Physics is full of embedded video lessons that both cover the core content and provide in-depth extensions for many interesting topics. and apply it to the real world. Mathematics is the language of science but the DIALECT of math spoken in math class is different from science class. The equation of a line is y = mx + b, right? 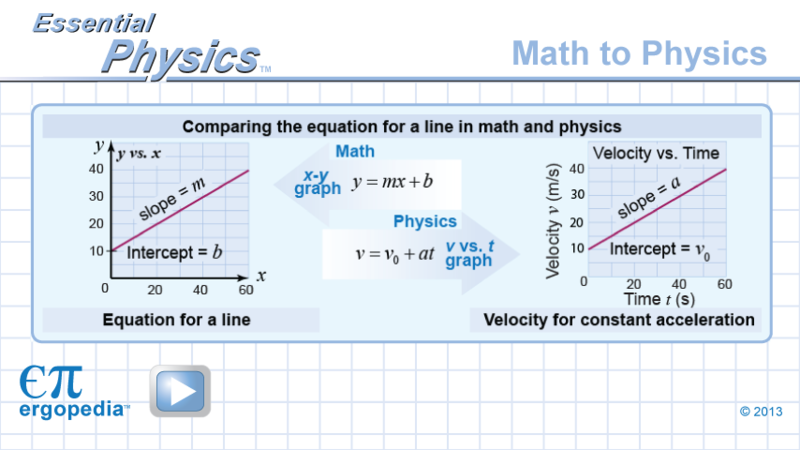 Well, v = v0 + at is ALSO the equation for a straight line in the dialect of physics. 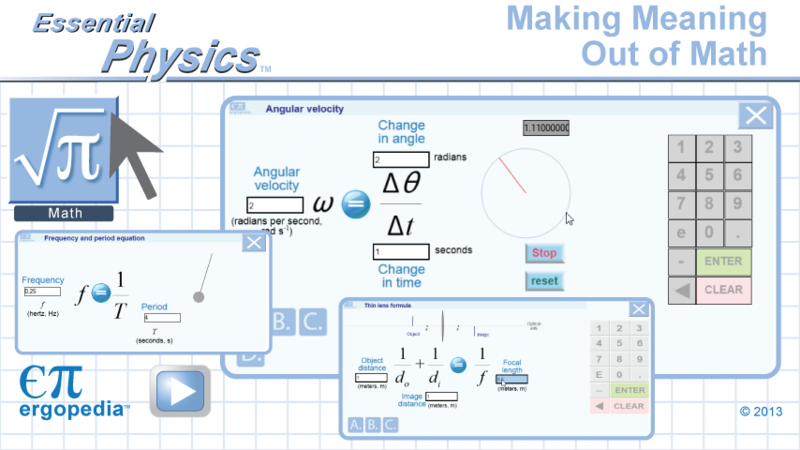 Essential Physics provides clear graphical translations from math class math to real math applications in the text as well as in both the slides and student assignments. Most of us connect with science through technology. 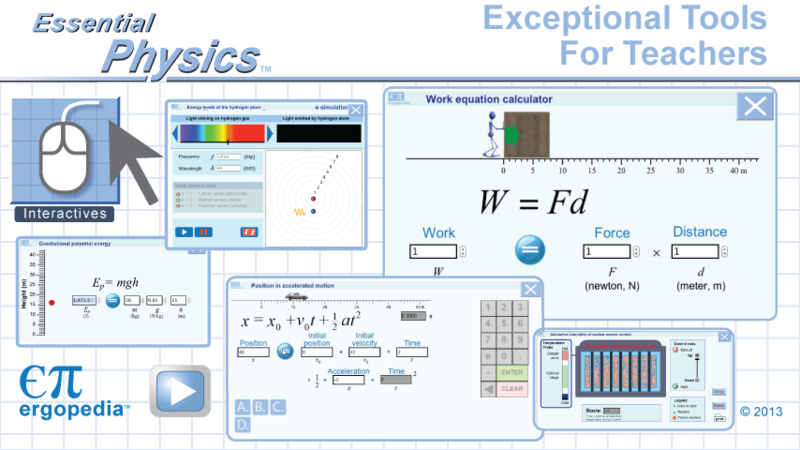 Essential Physics shows how every concept in physics is applied in technology. 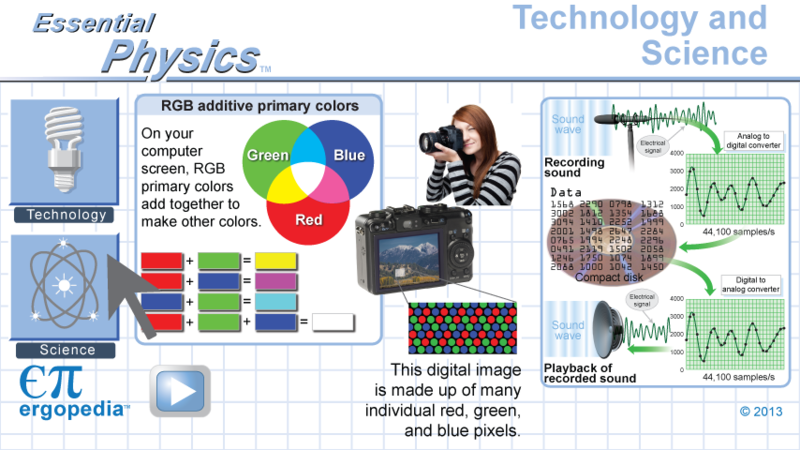 From simple concepts such as the RGB model of light and color to complex technologies such as digital recording, students see the relevance of every aspect of physics through its application in a technology they use. Engineering is the application of science to solving human problems. Essential Physics includes design projects in which students are challenged to apply principles to come up with solutions. 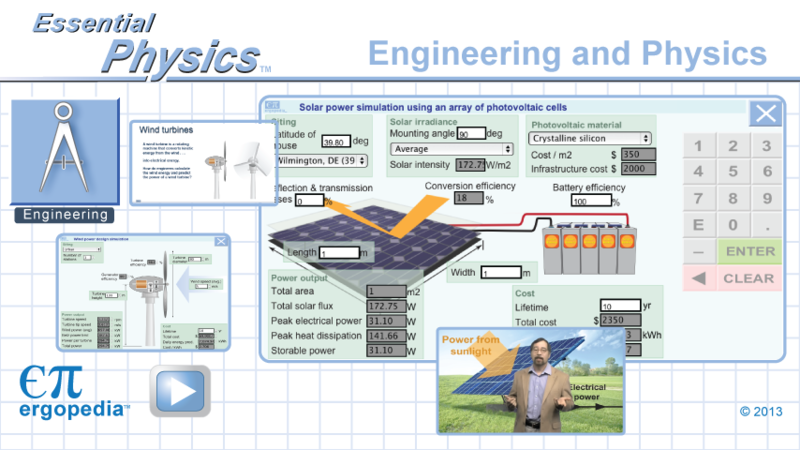 Engineering simulations allow students to tackle more complex systems such as solar power or wind turbines. They learn about the real trade-offs between different aspects of performance and between performance and cost. These lessons apply far beyond the physics classroom. Complete and detailed slide presentations, as well as videos, provide you with teacher support for even the most challenging lessons. Essential Physics includes a complete kit of new lab apparatus. The new ErgoBot is a complete rolling motion laboratory, able to sense position, velocity, and acceleration in real time with 1 mm of spatial resolution. The ErgoBot is also a sophisticated robot capable of executing vector navigation commands, following a force versus time curve, and demonstrating virtually any type of one or two-dimensional motion paths. A complete electric circuits and electronics system, sound and waves equipment, and a powerful new optics bench are among the many high-quality components in this lab package. You won’t want to be without it! Learning by doing is our core instructional belief. This is also the literal translation of our id. Ergopedia comes from two Greek words: ergo meaning “work” or “doing,” and pedia meaning “learning.” We believe that students learn best by engaging in hands-on activities through a process of guided inquiry. From structured to guided and open inquiry. Science investigations in the early chapters of Essential Physics follow the structured inquiry approach, where the curriculum defines the problem, procedure, and materials. As students develop the tools of problem-solving in science, the pedagogy deepens to guided inquiry, where the students devise the procedure to address a problem posed by, and with materials provided by, the teacher. The design projects included in each chapter deepen the investigative process to open inquiry. Spiraling through content deepens understanding. Students will learn a topic and remember it best when the instruction spirals back onto it throughout the year from different perspectives and in ever-increasing depth. Essential Physics is structured with an introductory chapter that touches on the full range of physics—from mechanics to electromagnetism and the atom. The introduction paints the broad outline of the science of physics by emphasizing concepts rather than mathematics. The main part of the course returns to each topic in depth and increasingly develops more sophisticated mathematical tools. e-Book prices are for the life of the adoption - this is not a subscription! 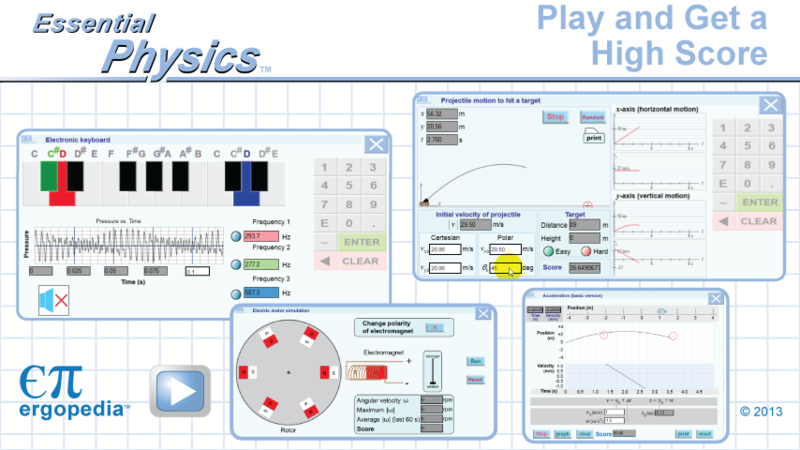 Essential Physics is available as a hardcover textbook, online, on DVD-ROM, SD card or USB. Each hardcover textbook includes one DVD and one student license for the e-Book at no additional charge. The e-Book may be copied onto local storage by copying a single folder, such as on a school server, laptop or desktop computer. There are no individual student accounts. For example, a district purchasing 100 e-Books (or any combination of 100 e-Books and textbooks) may freely allow up to 100 students, any 100 students, to use the curriculum, for the life of the adoption. Ergopedia reserves the right to charge for additional licenses if enrollment increases by more than 5%. A single Teacher's Edition comes with a license to teach one student. A school or district wishing to use materials from the Teacher's Edition to instruct 30 students must purchase at least 30 student e-Books. The full Equipment Kit contains the Ergobot, Optics System, ErgoTrack system (including Tripod Stand), Oscillations and Waves Kit, Circuits and Electronics Kit, and Forces and Machines Kit.